Approximately 150 students from across northern Santa Barbara County received hands-on exposure to local STEM industries Tuesday during a four-day outreach and education event. Organized in partnership with EconAlliance and Santa Maria-Bonita and Santa Maria Joint Union High School districts, STEM Industry Days 2018 is designed to connect low-income middle and high school students with local professionals in science, technology, engineering and math fields. "The idea was to introduce students to real-life STEM professionals and show them some of the careers and jobs available," explained program organizer Victoria Conner, initiatives director for EconAlliance. "We really want to acquaint them with what is possible in the different industries." Students in grades five to 12 who receive services from Fighting Back Santa Maria Valley, Boys and Girls Club of Santa Maria Valley or reside in properties owned by Peoples Self Help Housing or Housing Authority of Santa Barbara County were chosen to participate in the program. Tuesday's session, which was held at Santa Maria High School, drew roughly 20 high school students from throughout the area. "Students often don't realize there are very modern and well-paying employment opportunities in the area," said LeeAnne Del Rio, career technical education incentive grant coordinator for the high school district. "There are not just agriculture or manufacturing jobs in Santa Maria, there are booming, modern technical jobs in growing industries across the region." According to Del Rio, several of the local industries participating in the program are unable to hire locally due to a lack of properly trained workers. She hopes linking students (and future employees) with established professionals will bridge that gap. "We're trying to connect their educational experiences [with the local workforce]," she explained. "These companies want to hire locally but sometimes they can't because the people looking for work don't have the relevant skills for the job." While Santa Maria High School sophomore Cece Watson had heard a lot about virtual reality headsets — seeing them everywhere from in stores to on the news — she had never actually tried them and didn't know how they worked. "VR is going to explode in about three to four years," Trevor Orrick, CEO of VMUV, a Santa Maria-based VR company, said as he placed the headset on Watson's head. Within seconds, Watson went from the front of the classroom to a 3-D virtual oil field. 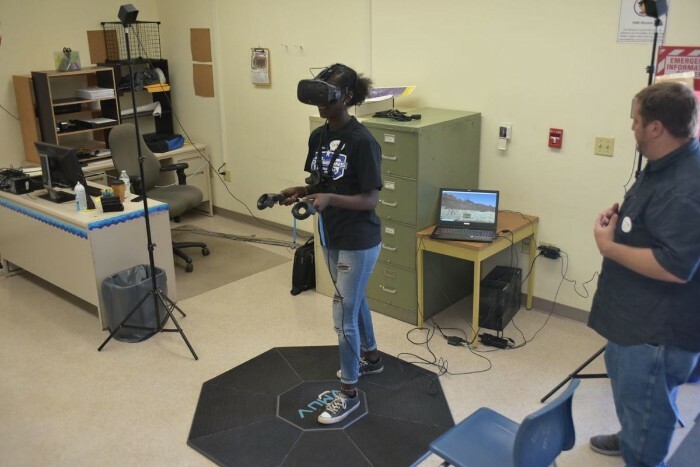 Designed as a proof-of-concept of employee training for Aera Energy, Orrick watched as Watson used one of VMUV's proprietary VR mobility pads (developed and manufactured in Santa Maria) to traverse the virtual environment in search of a simulated oil well fire. "There are applications in all industries for this technology," said Orrick, who hopes to contribute enterprise VR applications. "In the future, I imagine every company will use [VR] at least three to four hours per day." Megan LeBlanc, reporting manager with agricultural research group Pacific Ag Research, said she opted to participate in the program to serve as a role model for girls considering a career in a STEM field. "Seeing a woman up front with a Ph.D. working in agriculture is valuable, especially to a lot of teenage girls," she said. "Engineering, physics and chemistry are still male-dominated. Women need to know, from a young age, to not be afraid or intimidated."